Return Requests are always based on deliveries or A/R invoices in the old version of SAP Business One, but sometimes users need to create return documents without a previous document. From SAP Business One 9.0, users can choose how to set item cost when the document is not based on a previous document. Go to Administration > System Initialization > Document Settings > Per Document and choose Returns. 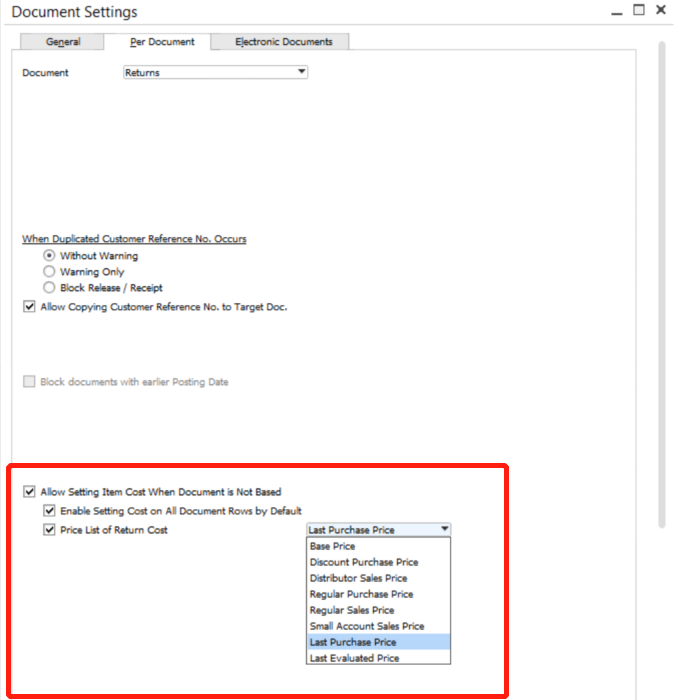 Click “Allow Setting Item Cost When Document is Not Based” and choose the way you prefer. This choice shows up on Returns and A/R Credit Memo documents. If you are interested in how to we also integrate with Excel and offer a report designer, please visit Excel Report in SAP Business One.